I have now been living in Brunswick for just over three weeks, and I can’t believe how quickly it has begun to feel like home. The location of the house is great, situated very close to the main streets where all the pubs, bars, and restaurants are, and only a short walk from the supermarkets. There is a library down the road which I have become very well acquainted with, what with the arduous task of still having to sort out paperwork for my nursing registration, and the gym is just across the road from the library. I’ve gone as far as going for a tour at the gym and looking into classes I’d like to join, but have decided to leave joining up until I start work and can manage the extra outgoing costs and will have more of a routine. I’ve tried to say yes where possible and make the most of opportunities to meet people. One day I decided to get out of the house and find a pub to read my book. I googled the nearest pub and sat myself at the bar and had a few drinks. Before the night was out I’d got to know a couple of people who are regulars at the pub, who have gone on to be people I have met quite regularly since, and the pub has very quickly become my ‘regular’! It’s nice to have a place I can pop into any evening and bump into a familiar face. Through the powers of Facebook, I also found a regular pub quiz team at the pub round the corner from my house, and we all meet every Tuesday. I can’t honestly that I am contributing much to the quiz, but it’s nice to have a regular social event! I spent the first two weeks wondering whether I’d made the right decision in leaving everything behind to move to Australia, but I can safely say now that it is one of the best decisions I could have possibly made. I miss home, friends, and family terribly, and I even miss my job. However, I’ve realised that you can’t have everything in life and that you need to compromise on some things. Life is about pushing yourself outside of your comfort zone, and life really is too short to hold back on the things you dream of doing on account of the things you don’t want to leave behind. I’m a stickler for routine and home comforts, but I have taken comfort from developing new routines and finding new safety blankets. I used to listen to podcasts every single drive to and from work, and surprisingly have found it a great comfort to continue to listen to the same podcasts here. Thankfully the power of the internet and WhatsApp chats means I have no problem keeping in touch with people at home, despite the time difference! Finally, last week I received some good news. On the Wednesday of last week my 4-year sponsorship visa was granted, meaning I am no longer on the Working Holiday Visa and therefore farm work is definitely not something I have to worry about anymore - woohoo! I can stay in Aus until July 2022! Just two days later, I received my ‘offer in principle’ for my nursing registration with AHPRA. After six months of stress, worry, and repeated back and forth with both immigration and AHPRA, to get both things sorted within the same week was the biggest relief. There were numerous times at which I felt like giving up as I couldn’t handle any more stress of chasing of documents or employers, but I am so pleased now that I persevered. All I need to do now is present my ID documents in person at an AHPRA office and I am good to go. Now that I have a timeline and am able to budget my finances accordingly; I have agreed a start date for work of the 10th September. I’ve booked to go to Bali for two weeks in August, and am hopeful to find a few weekend breaks too. I am heading away this weekend for a short break to a town in Victoria called Bright, with three other girls, which I’m looking forward to. It’ll be my first ‘road trip’ in Australia and hopefully the first of many. Although Australia is pretty similar to the UK in a lot of ways, I've come across a fair few things so far that have surprised / amused / confused me, and here they are. 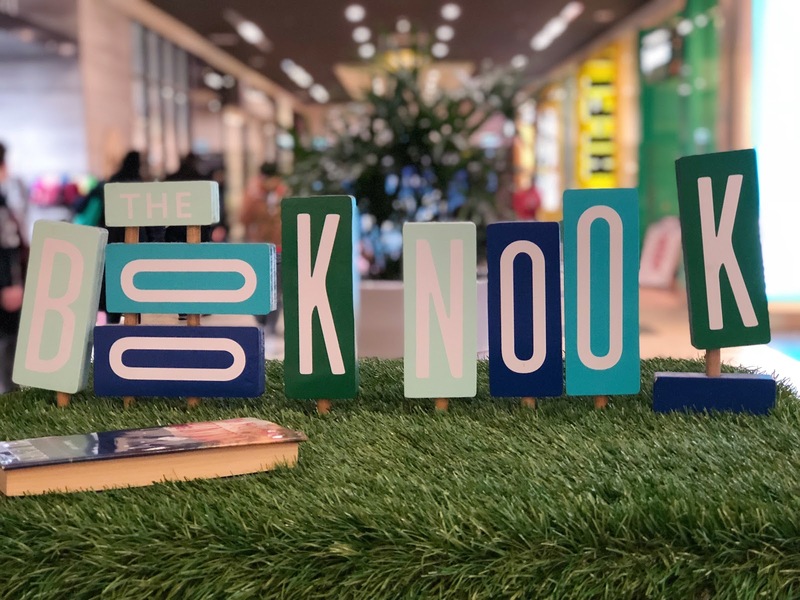 In many shopping centres you will see a 'book nook'; put simply, this is a book exchange system where you leave a book behind and take a book. I love this idea as it means that once you've finished with a book you can get rid of it, but get something new to read at the same time. In theory I'll never have to buy another paperback again! I am finding it difficult to get my head around the change here in Aus, as the coin sizes don't correlate to the value of the coins, and seem pretty backwards. For instance, the smallest coin is about the size of a 5p and is actually a $2 coin. I was just about to ready to chuck all my $2 coins into a charity box until someone kindly pointed out that they were worth quite a bit! Something I can't quite get used to is that when you buy something, the amount will be rounded up. For instance if something comes to $23.47, you'll be charged $23.50. This saves all the irritating small change that seems to gather, but it's an odd concept to get used to. 'Pay Pass' - At home we have contactless card, but here it's called 'pay pass' and you will be asked if you want to 'pay pass'. Confusing at first if you don't realise what it is! Also, you can tap and pay for much larger amounts, which is pretty dangerous when it feels like every time you tap you're not actually spending any money! I already knew that Australians like to abbreviate everything, but I have now realised that they like to abbreviate everything. Going to the petrol station? The 'servo'. Need a cool-box? It's an 'esky'. Want to buy some alcohol? Get yourself down to the 'bottle-o'. Work as a skilled labourer? You're a 'tradie'. Most shockingly for me was when I went into a chemist to get some toiletries, asked the sales assistant where to find a few things, and she had to ask me a few times what I was saying! Cider is my drink of choice, and I drink it in pints. Here in Victoria, you can't always get a pint. You'll either get a pot (half-pint), a schooner (in between a pot and pint) or a pint. Go to Queensland, and you'll get a middy instead of a pot, and you'll also get a schmiddy or a pony. The worst thing about drinking in Australia however, is that a pint is around $10 (GBP5.58), which pains me greatly. Everyone here is so damn friendly. Everywhere you go, whether it's a bar, shop, restaurant, or public transport, you'll get a friendly greeting and genuine warmth. Sometimes it's a lot, especially when you want to go somewhere like Priceline (the equivalent of Superdrug) and someone approaches you to ask you if you need help. I'm the kind of person that needs to be left to browse, so sometimes the over-enthusiastic offers of help are too much! One of the most surprising things I have learned about in the last week or so, is 'hard rubbish'. Now this really is quite a sight! 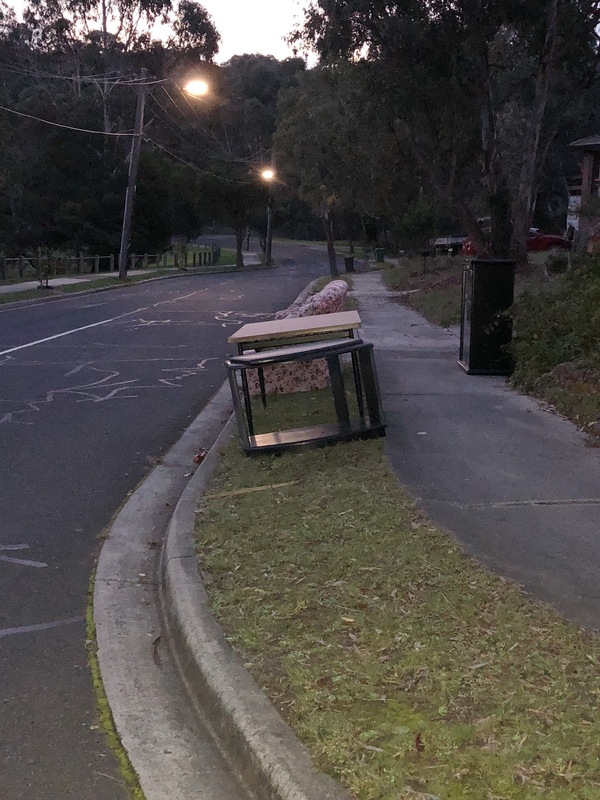 Apparently every six months or so, the council comes around with a truck and picks up any 'hard' rubbish that people leave out on the streets. This is your bulky rubbish that you would ordinarily take to a dump or put in a skip, such as furniture, beds, electrics, garden furniture, and so on. People leave it outside their houses and other people come and help themselves (supposedly there are laws against this, but that doesn't stop people). The picture above is the remains of a hard rubbish week - I walked along one road where there was so much junk I could barely walk along the pavement! What we call charity shops, are 'op' shops here. Again, another abbreviation, standing for 'opportunity shops'. They are a really big thing here and there are actually proper stores for op shops. People even make a thing of going 'op shopping'. I have used Uber at home maybe once in my entire life, but here everyone uses some form of Uber. There are various different taxi apps (Ola, Taxify, Didi, Uber), and each offers discount codes, especially if you share the codes with friends. So by swapping codes with other people, you both gain discounts and can get super cheap travels. Sometimes Ubers work out cheaper than public transport, and it's a great system when you want to get home from a night out. I've found that alternating between the various Uber apps ensures that I can get the cheapest journey. © Laura Kate Life | All rights reserved.